Twitter, a wonderful tool for crafting bloggers and artists to make connections in the virtual world. These relationships can transpire into more traffic and ultimately increase sales. I’m going to assume that you already know the basics of Twitter, but just in case, Twitter is considered a micro-blogging site, because users are allowed to post updates of no longer than 140 characters. In other words, a teeny blog hosted on Twitter. When you sign up for a Twitter account, you must register a username and set up a profile for either your personal life or crafty business. The naming is very important here, as you’ll be stuck with it for awhile. Many crafters choose the name of their business or Etsy store, or they might use their first name and craft medium (like mine, LindsaySews, which is also the name of my blog). The same goes for the profile section, example below (“A writer and editor by day…”). This is the space to send a brief message of what your Twitter postings will be about, like knitting or technology, so others can find you! If you plan to tweet about marathon training, but your username is chocoholic, people probably aren’t going to find you. There’s also a spot to put a link to your URL (blog or Etsy store). Use this space! When choosing your photo icon, think of this image as prime real estate for your craft business or blog. Rather than selecting an icon of a cute cat or a cherry blossom tree, why not show off your best-selling product? A blogger might use her profile photo here or a logo, which is also a good choice, because it makes people feel like you are a real person. Whether you go with your face, company logo or a product shot, make sure your profile pic displays the feel, personal or professional, that you want to convey through your Twitter account. After you’ve set up your account, it’s time to make your first post, also known as a tweet. After all, you don’t want people to find you and notice that you don’t have any content on your page. My first tweet was about sewing and included a link to a blog post that I hoped readers would find helpful. If you are stuck for ideas, feel free to simply post “I’ve joined Twitter!” or something similar. You may also wish to customize your background image now (in the Design page on Twitter), so it matches the feel of your blog or online store. Twitter wallpaper or backgrounds are available at TwitPaper and many other sites or you can make your own. Do a Google search for Twitter Backgrounds for countless free options. Now that you’re set up, it’s time to make some contacts! Twitter has a tool that allows you to import contacts from your Web-based e-mail account, which is a good start for finding people you know in the real world. Find their profiles and follow them. When you find someone whose tweets you enjoy, click on their list of followers. 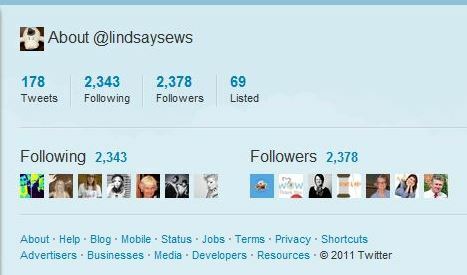 (In the example below, you would click on the blue 2,378 to see who is following LindsaySews). This is a great way to see who is also tuning in to this person’s posts. Follow anyone who sounds interesting! You may also wish to see who that person is following (the blue 2,343), because they likely have the same interests you do. Follow along with some of those users and start making connections. Statistics show that around 30% of people you follow will follow you back. As you can see, I’m now following almost the same number of people that are following me. That doesn’t mean that all of the people I follow are also my followers, but many of them are. One interesting quirk about Twitter is that you can only follow so many people per day. If you try to go beyond that magic number, Twitter will tell you to wait until tomorrow. The more followers you have, the better your follow ratio and the more people you’ll be able to follow. Some of the “superstar” Twitter users may have 100,000 or more followers, but they follow fewer than 10 people. This is someone who is known to have great Twitter power, or a large audience. You do not have this kind of following ratio to market yourself effectively on Twitter. In fact, some might say that having a more equal followers-to-following ratio makes you seem more approachable and personable, a definite advantage in the crafting and handmade communities. After using Twitter for some time, you’ll probably figure out the users who are not worth following (especially if they aren’t interacting with the community and are always about self-promotion) and you may choose to unfollow them. Being an active citizen in the Twitter world, especially the handmade marketplace, involves some give and take. Support others in their endeavors by retweeting links and contests, and spread kindness. You’ll be surprised how many people take notice. When I started Twitter, I wanted to follow as many like-minded people as possible. I found StacySews, sewLindsaysew, and some other quilting and sewing bloggers who I wanted to “meet.” I followed them and occasionally “mentioned” them in my posts. 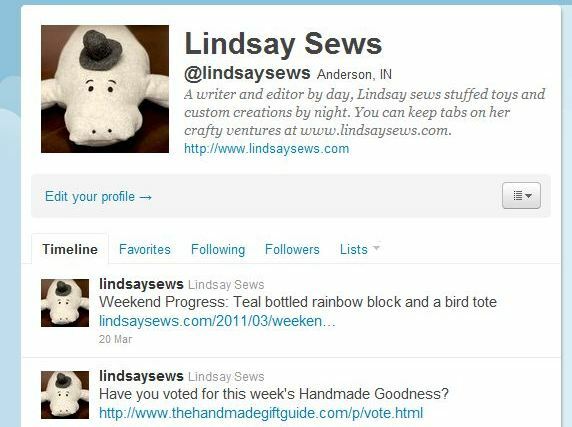 (You can mention another user by typing the @ symbol and their user name in a tweet, like @LindsaySews.) Before long, people started following me back. I used my best judgment on who I wanted to follow. If a person updated too often or filled up my screen with too many off-topic tweets, I’d unfollow them. There’s a tradition on Twitter called Follow Friday (also known as #FF), in which many users choose to mention 5 or 6 other Twitter members. An example would be a post that reads: #ff @craft @GibbsRules @kzooerica @knitpurlgurl. If someone menti0ns you in a #FF post, it is courtesy to thank them and perhaps return the favor. READ MORE on Craft Buds – Twitter lists, Searching, and Awesome Twitter Tools. Thanks for the advice! I have been on twitter for a couple of months and I really don’t know what I am doing! I think I am one of those “self promoters”! I didn’t know about Follow Friday , but I am going to try it tomorrow. I am am also going to change my icon to be one of my products, instead of my company logo. Great ideas, thank you so much! I’m in the same boat – I need to make a simple “to do” list to remember how to return favors, promote others, etc. I’ve been guilty of just posting my new listings. Just don’t get on Twitter that much, so I don’t think/remember what I should be doing, or how to do it. I’m more familiar with facebook. This is great, I’ve been on twitter for a while now and I still don’t know alot about it. Love learning. Thanks!!!! I’d also like to suggest that your icon be a picture of you and that you add personal tweets between your business tweets. It gets pretty boring for your followers if all they see is “new to my Etsy shop…” or “just blogged”. It’s a great way to become active in the community because people get to know the person behind the business. They’ll still know you are a business and what you do because of your name & other twitter content. Has anyone messed with TwitPic.com? It allows you to upload a picture. I’ve used it to upload, but haven’t noticed any of my connections using it. Nice article. btw JustUnfollow is a great little tool for unfollowing. It shows who has not followed you back and lets you whitelist people you want to keep anyway. The developer answers support email too, usually within a few hours.